If you’re looking for customised or quirky sneakers that will be the talk of the town, look no further than Lazy Jojo. Either personalise it or buy from their collection of kicks that come with comic strips, florals, doodles and patterns and Garfield! If you are to go by that, then there’s nothing more perfect than wearing your style on your feet. Enter Lazy Jojo’s awesome technology and a band of artists and creators who digitally print photos, images and anything you want onto a pair of shoes. We tested out the customisation option on the website and it’s quite simple actually. First, select a Converse-type pair (high tops or low tops) of sneakers in your size. Then you’re redirected to a customisation page that allows you to add text (they have hundreds of font styles) and upload your own design. Once you are happy with your design, save it, and add it to the cart. All this for a cool INR 1,999. No more of having to wear those boring old Plain Jane sneakers, we say. 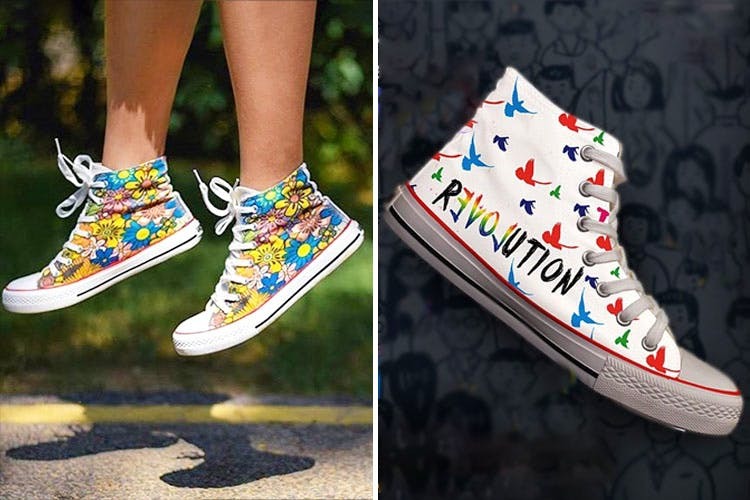 If you’re not looking for customised kicks, then they already have a collection that ranges from cartoon and comic characters to edgy prints and polka dots. Their extensive collection of graphic shoes, that feature everything from Super Mario to Bob Marley, should give you inspiration. Or just buy off the proverbial rack, and pick an existing design which you like. Especially since there really is a vast collection online. We spotted cool kicks which were a funky pair of high-top sneakers that’s got the Rolling Stones iconic tongue print. The 90's kid in us responded to designs featuring Scooby-Doo and Tom & Jerry. They have Bollywood prints too.